Energi TriPak is a control system consisting of wireless sensors, switches, dimmers, and remote controls that maximises energy savings for any room, at any budget. Energi TriPak installs 70% faster than wired systems. In fact, you can install a switch and sensor in as little as 15 minutes. And since no new wiring is required, you won’t disrupt occupants in a space. 0-10 V analog control is widely utilised in the industry for both fixtures and controls. 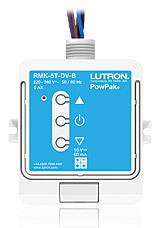 The new PowPak dimming module with 0–10 V control allows the control of 0–10 V fluorescent ballasts and/or LED drivers based on input from Energi TriPak wireless sensors and remote controls.